Photo Courtesy University of Notre Dame Archives. Talk about a timeless photo. Well, I spent five years as an undergraduate at the University of Notre Dame. A small glitch in one of my electrical engineering courses put me out-of-sequence towards my E.E. degree, so I decided to also get a history degree while I was still in school--that meant some semesters with 20 or 21 credits, but the history degree did come in handy later on! I ended taking a fair amount of history courses. Some better than others; some a lot, lot worse. The ones that I most enjoyed, and the ones that I found most interesting by far, were those taught by Professor Bernard Norling, who was professor of European history. Boy was he tough, but what great classes! Norling's old-style lectures were unbelievable. We would walk into the classroom, and he was almost always ready to go, standing behind the lectern; there was not a lot of chit-chat going on. 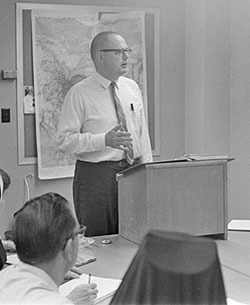 Behind Norling, the blackboards were usually filled with neatly written terms, names of people and places that would be covered in the lectures. All that was done to make it easier for us to keep our notes--I tried putting important names and terms on the board in my classes some years later and found that no one bothered to take notes anymore. I asked one of my students sitting in the very front row one day why he didn't bother to take notes, and he replied, "I have a photographic memory." After taking attendance, Norling would lecture, fifty minutes or seventy five minutes, I am not sure anymore, but his classes were primarily lecture. There was no work on primary sources or extended student discussion. I still remember sitting there listening to him talking about the battle of Poltava (1709) and Charles XII of Sweden. Talk about one of the lucky breaks in history for the Russians. His classes tended to be pretty small as I recall--and easy to get into--mostly because of his reputation for toughness as a grader, but I never had any problem with him. I never really had any face-to-face dealings with him, until one day, I had to leave the class very, very quickly because I was sick. I dared not re-enter the class and waited outside in the hall for the class to finish, listening to bits and pieces of the lecture. When the other students left, I re-entered and apologized to him. He said, in a kind of dry voice, "no problem." I later learned that he had written on medicine in military matters; I knew that he was very good with military history. I also kept for a long time, one of his letters that he had written to The Observer, the student newspaper, from 1980, "The Poverty of Liberalism." Yes, he was a very conservative individual, which makes it even more bizarre that I got along well in his classes, but he respected you, and we respected him. Interesting in regard to his political beliefs, on one of the biographical questionnaires that he filled out (now in the University Archives) in 1983 (just after I had left ND), for the question regarding "religion," Norling wrote: "Impossible to answer briefly in this theologically anarchic age." That says something! Last thing. When I applied to graduate schools to study Russian history, I did apply to Notre Dame. I was accepted at the University of Virginia, and since I had become a Virginia resident, it was not going to cost a whole lot to go there. Besides, UVa also had an impressive program of professors in Russian studies. I accepted and confirmed at UVa. A few weeks after that, I received a very kind letter from Professor Norling, who was the acting chair of the department of history at the time, telling me that I had been accepted to the graduate program at ND, and with a full scholarship. I wrote him back, thanking him very much for the kind offer and for his words of support, but then I also told him that I had already decided to go to UVa. A few years, ago, I sent Professor Norling, retired, one of his books that I had kept for some years--but never got around to reading--and asked if he would please sign it for me, and I also told him how much I had enjoyed his courses and respected the standards that he had set as a professor. 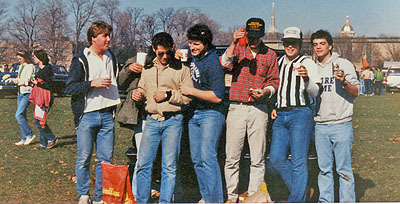 Here is a photo of what we looked like back at Notre Dame. Ph.D. thesis was "Foreign Policy Opinion of the New Statesman & Nation, 1920-1939"
He then taught at Notre Dame from 1955 until his retirement. In an obituary (accessed once at www.nd.edu/~ndmag/w0304/obits.html), "He was a demanding teacher who wanted to leave students with an understanding of how history related to and could enrich their lives, and his message often got through....The modern world was not much to his liking, but he had great tolerance for others' views and never forced his on people."